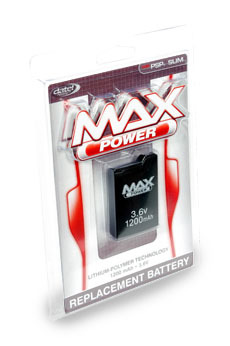 The MAX Power Slimline is a lithium battery for the PSP designed in a slimmer package to fit the new Slimeline PSP. Keep it charged and you always have a back-up in case your main battery is drained at a crucial moment. Up to eight hours of use per charge. Always have a spare battery handy. Quality/Usability : Its always good to have a backup battery. You never know when you'll be in an area with an outlet or USB port to help keep your PSP Slim powered. Sometimes you're so immersed into the game that you dont even notice how much battery life is left until you see the battery indicator blinking or worse...the PSP shuts off in the middle of your game. The Datel MAX Power Battery 1200mAh is Datel's answer to Sony's replacement and backup battery. The size of the battery is practically the same size of that of the Sony PSP Slim battery. MAX Power takes about 1-2 hours to full charge. Once fully charged, the battery provides 4-7 hours of play depending on the settings on the PSP Slim such as volume and brightness. The lower the settings, the longer it will last. Conclusion : Overall, the Datel MAX Power Battery 1200mAh is a good replacement whether you're looking to replace your battery or looking for a spare battery. Price however is on the expensive side. Its almost the same price as a Sony brand.